Describe the role of FSH and LH in driving follicular development. Diagram how estrogen is produced by cells of the theca interna and zone granulosa. The histological appearance of the organs that compose the female reproductive system undergo cyclical, structural changes that are not pathological. These organs include the ovary and uterus, and the histological changes in these organs are driven largely by four hormones: follicle-stimulating hormone (FSH), leutenizing hormone (LH), estrogens and progesterone. This page will describe the histological changes in the ovary throughout the course of the menstrual cycle. The human ovary consists of an inner medulla and outer cortex with indistinct boundaries. The medulla contains the blood vessels and nerves, while the cortex is occupied by developing follicles. A cross-section of an ovary will reveal follicles in various stages of development. 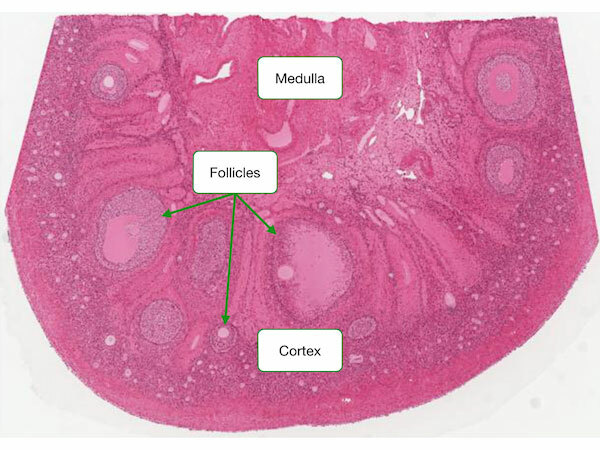 The next sections will describe the histological features of each stage of follicular development and the major functional changes in the cells compose follicles. An ovarian follicle progresses through several distinct phases before it releases its ovum. During the first five months of development, a finite number of primordial follicles form in the fetal ovary. 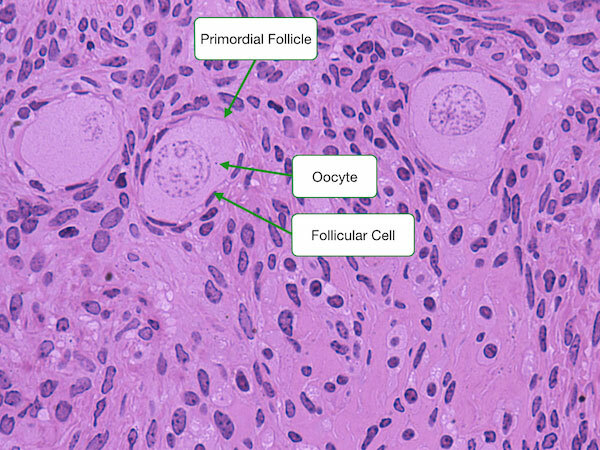 These follicles consist of oocytes surrounded by a single layer of squamous follicular cells. These primordial follicles remain in the process of the first meiotic division. At puberty, they begin to develop further and become primary follicles. At the start of each menstrual cycle a limited number of primordial follicles are triggered to develop. 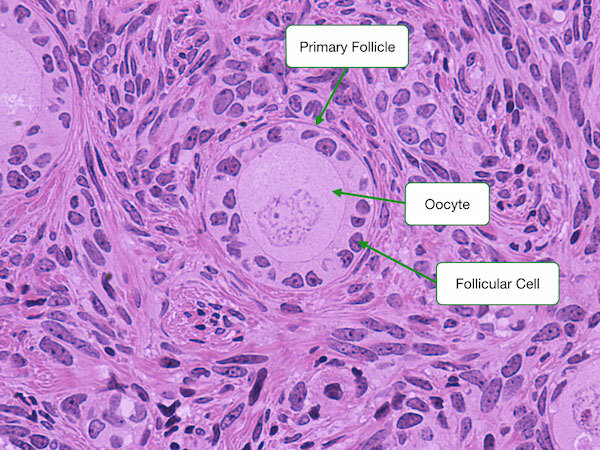 The first apparent histological stage is the early primary follicle that consists of a central oocyte surrounded by a single layer of follicular cells which have become cuboidal. The zona pellucida is a thin band of glycoproteins that separates the oocyte and follicular cells. Proteins on the surface of sperm will bind to specific glycoproteins in the zona pellucida. The late primary follicle stage is reached when the follicular cells proliferate into a stratified epithelium known as the zona granulosa. The zona pellucida enlarges and can be seen even more clearly in this image. 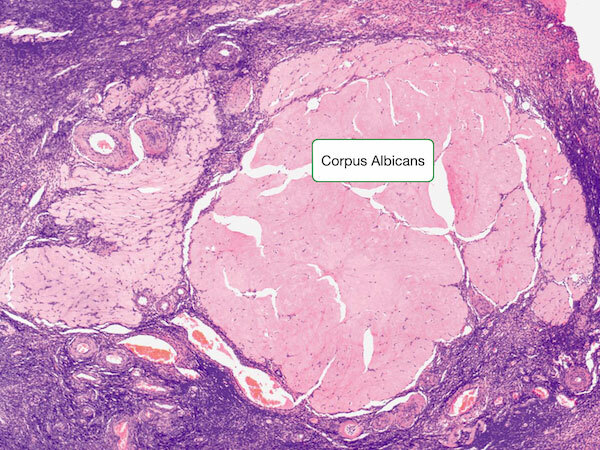 The characteristic feature that distinguishes secondary from primary follicles is the appearance of a follicular antrum within the granulosa layer. The antrum contains fluid which is rich in hyaluronan and proteoglycans. 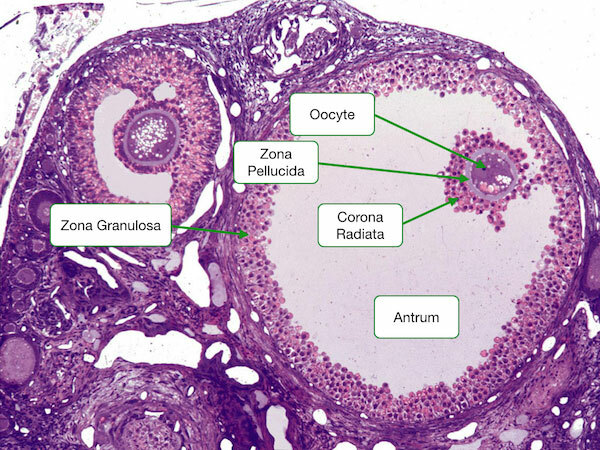 Note the increase in cell layers of the zone granulosa, the thicker zone pellucida, and larger oocyte. 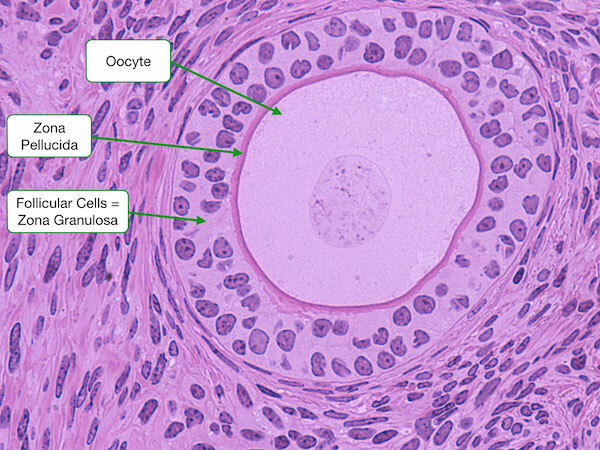 At this stage, a layer of cells outside the follicle become evident. These cells compose the theca interna and contribute to the production of estrogens. Recall that the production of estrogen requires both the cells of the theca interna and granulosa cells. Estrogens, like all steroid hormones, are produced from cholesterol through a multi-step process that requires several different enzymes. Neither the cells of the theca interna nor the granulosa cells contain all of the enzymes necessary to convert cholesterol into estrogens. Theca cells contain enzymes that catalyze the initial conversion of cholesterol into androgens but lack aromatase that carries out the final steps of converting androgens into estrogens. Consequently, androgens produced by theca cells diffuse into the granulosa cells which contain aromatase but lack the enzymes for the initial steps in estrogen synthesis. The theca cells are in a better position to catalyze the initial steps in estrogen synthesis because they are closer to blood vessels and can take up LDL to obtain cholesterol. The Graafian follicle is the stage after the first meiotic division has completed but before ovulation. The oocyte is now a 2N haploid. 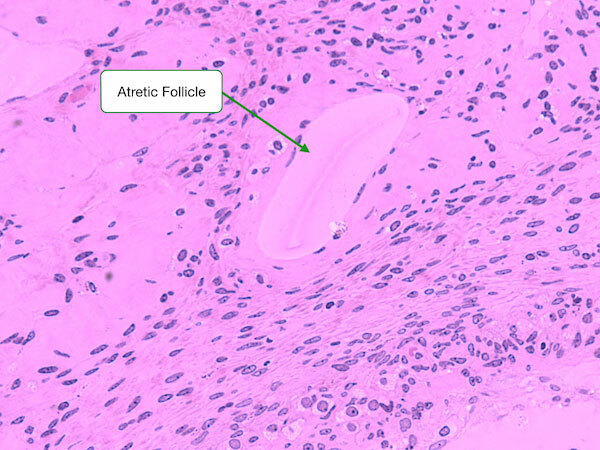 The follicle is characterized by a large follicular antrum that makes up most of the follicle. The secondary oocyte, having undergone the first meiotic division, is located eccentrically. It is surrounded by the zona pellucida and a layer of several cells known as the corona radiata. 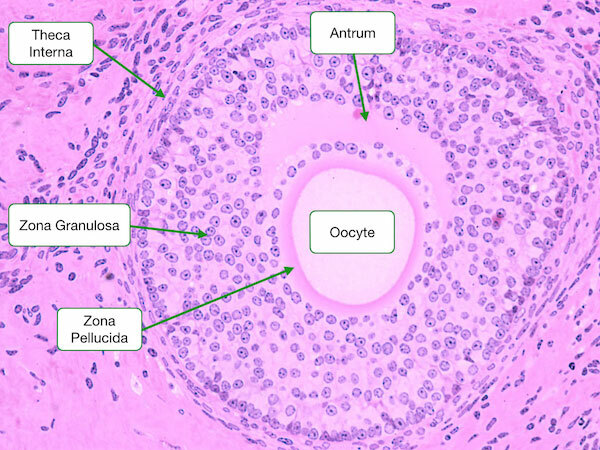 When released from the Graafian follicle and into the oviduct, the ovum will consist of three structures: oocyte, zona pellucida and corona radiata. After release of the ovum, the remaining cells of the granulosa and theca interna form the corpus luteum. The center contains the remains of the blood clot that formed after ovulation. Surrounding the clot are glanulosa lutein cells and on the outside theca lutein cells. These cells produce progesterone and to a lesser extent cholesterol. The granulosa lutein cells have an appearance characteristic of steroid-producing cells, with pale cytoplasm indicating the presence of lipid droplets. Theca lutein cells are smaller and more deeply stained. 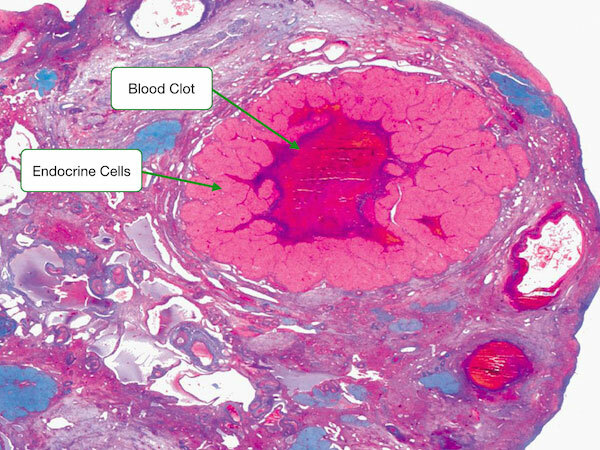 Blood vessels penetrate into region of the granulosa lutein cells allowing them to take up cholesterol to be used to synthesize progesterone. The activity of the cells of the corpus luteum is sustained by leutenizing hormone. If the ovum is fertilized and implants in the uterine wall, human chorionic gonadotropin replaces leutenizing hormone to sustain the activity of the cells in the corpus luteum. If fertilization does not occur, the cells of the corpus luteum remain active for roughly 14 days until the levels of LH fall and the corpus luteum involutes to form the corpus albicans. The secretory cells of the corpus luteum degenerate, are phagocytosed by macrophages and replaced by fibrous material. Each menstrual cycle, several primordial follicles are stimulated to continue development but only one follicles completes development to release an ovum. The other follicles degenerate through a process called atresia which can occur at any stage of development. During atresia, granulosa cells undergo apoptosis and are replaced by fibrous material. The oocyte degenerates and the basement that separated the oocyte from granulosa cells thickens to become the glassy membrane.